Spring feels a bit like a work-in-progress at the moment. It's cold and chilly outside, but there are all the wonderful spring bulbs and seasonal flowers giving us a hint of better days to come. I had to go into town last Thursday, and chose to follow the alleyway along the allotments that skirts the back of the churchyard. I walked under this amazing magnolia tree. And then I stopped, turned around and went back the way I'd come - just to have the thrill of walking under it again. Those big waxy flowers were so freakishly glorious against the perfect blue sky behind. I say freakish because they come before the leaves, and to my way of thinking that's just a little bit weird. And, inspired by the promise of warmer days to come, I'm working on a spring/summer knit that can cover up T-shirts for relaxed days outdoors. Right now I'm loving this Cobalt & Lime variegated bamboo, which looks like it was inspired by a summer's day at the beach. It knits up beautifully in stocking stitch, the colour adding enough interest for the textile not to look boring. I've knit this in the round with 9 rows of stocking stitch followed by a tenth row of double wrapped knit-stitch, which unravels when it's knit out on the following round to produce this lovely drop-stitch row. I think it adds just enough extra detail (and ventilation) to make a perfect summer sweater. It's a really easy technique and speeds up the already speedy-knit by adding a couple of extra rows' worth of length each drop stitch row. I've also got some wonderful organic cotton that I'm itching to knit into a string of delicate summer bunting, but that's another story. I always love the magnolia blossoms!!!! Ours are not here yet. And the knitting looks good. The magnolias or tulip trees are just beginning to bud here but there are other trees already in bloom. It's always such a pretty time of the year. 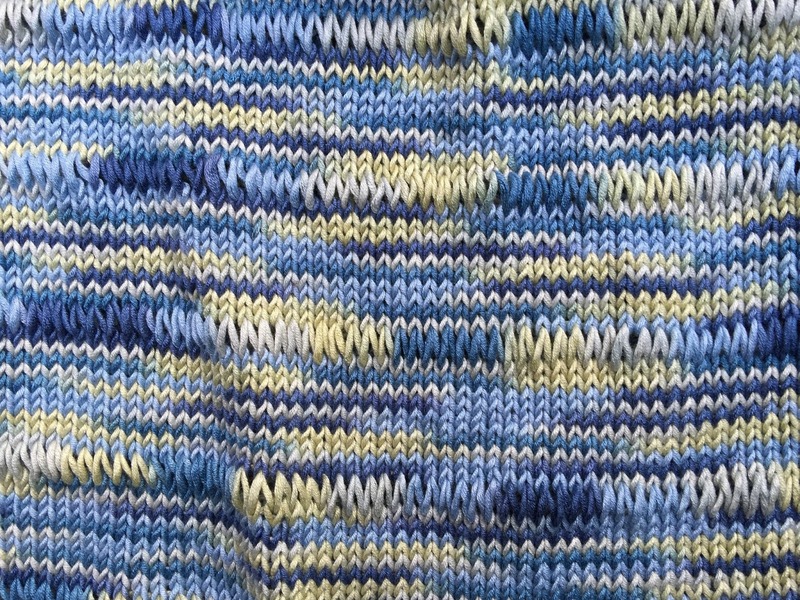 Love the colors of the sweater you are making. Wish I could knit.